Born in Shimoga Karnataka, Vritant has lived in Hyderabad for most of his life. In 2012 he completed his Masters in Computer Science from the University of Texas at Arlington, and since then has been working at Red Hat. 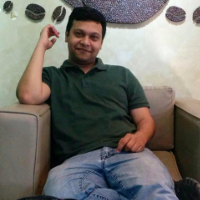 In September of 2016 he moved back to India and now continues to work for RedHat from his home in Hyderabad with his parents, near an extended joint family filled with cousins, aunts, uncles, nieces and a nephew! He loves to experiment with cooking, can strum a few guitar chords, used to write poems, and has a song ( sometimes made up ) for every occasion. He is obsessed with everything Doctor Who (pic), Harry Potter (pic), Marvel and D.C. (pic), and is known to be able to talk for hours if not interrupted. Born in Chennai Tamil nadu, Rinki is the youngest of three daughters and lives with her parents in Chennai. This madrasan was hoped to be a boy but turned out to be a girl ( something Vritant is thankful for ). She has been pampered and nurtured with love and care from her family throughout her life. She completed her Bachelors in Commerce from Stella Maris College, Chennai after which she didn’t quite know what to do next, and worked nearly for a year at the Royal Bank of Scotland. Her passion was not obvious to her until she chose Psychology as an elective during her undergraduate degree, and as time went by she became more curious about studying the subject in depth, specifically about marginalized communities. 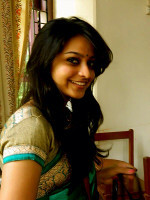 She joined the Madras School of Social Work for her Masters in Social Work. She has recently completed her degree in March of 2017 and was hoping to start work immediately after the course, but the cradle snatcher had other plans and shifted the cradle to Hyderabad . She loves traveling and long drives, where she prefers to drive herself because she doesn’t trust Vritant’s driving skills. She loves her parents the most! © 2017 Vritant And Rinki. Powered by Jekyll , Minimal Mistakes, Free DNS & Github pages.